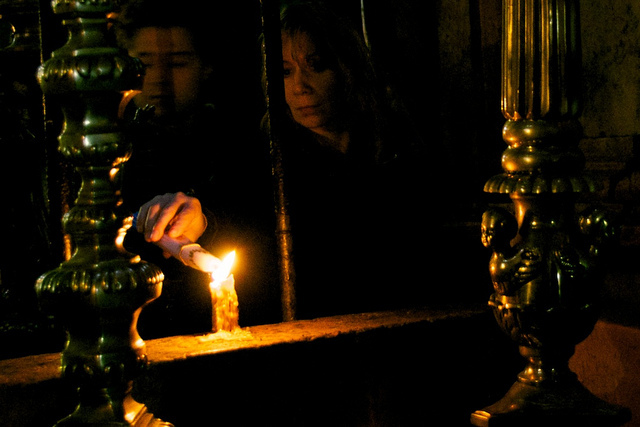 In this week’s edition of our weekly Wednesday newsletter, Scott writes about Holy Week pilgrimages, both mystical and literal. He’s headed to Jerusalem this year! One way to understand Holy Week is as a great pilgrimage, in which we are mystically transported to Jerusalem to walk alongside Jesus during the events of his final week and, ultimately, his great triumph on Easter Day. This is not a historical re-enactment, but a holy journey for every those of us to who “enter with joy upon the contemplation of those mighty acts, whereby [God] have given us life and immortality” (Palm Sunday collect). There is a flip side, of course. Maybe it’s more useful to think of Jerusalem, and Jesus’ great journey, being brought to us. It’s not that we go away, but rather that the Paschal Mystery is manifest for us. Either way, we realize that we are entering a great mystery, a Love that is larger than we either deserve or conceive. Usually around this time, I’m preparing for the pilgrimage of Holy Week by writing sermons or proof-reading bulletins or leading rehearsals. It’s a lot of work, but I’ve always found it deeply rewarding. This year, I’m doing a different kind of preparation. I’m blessed to be heading to Jerusalem for Holy Week. So I’ll be savoring both a mystical and a literal pilgrimage this year. This year’s preparation involves suitcases and travel logistics and exercise. I expect to do a lot of walking and standing as I attend many services during the week. I’m taking the St. George’s College Easter Fire course, and they’ve got us quite busy! I’ve always wanted to do this, and I’m not sure yet how it will form my observance of Holy Week in future years. Ask me next year. I invite you to join my pilgrimage, and I’d be blessed if you prayed for me and for all pilgrims (literal and mystical) in this holy time. If you want to follow along on my particular journey, you can find me on Instagram or Twitter, and I’ll probably blog a few thoughts along the way. I’m taking along a list of people to pray for while I’m in Jerusalem, so please do let me know if I can pray for you while I’m there. Wherever you are, I do hope you’ll make time in your life for Holy Week. If you can set aside time during the Three Holy Days (Maundy Thursday, Good Friday, and Easter Eve) for worship, you will find yourself transformed by the stories, the liturgies, and Christ’s presence with us through the journey.